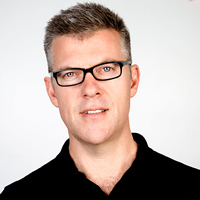 Paul Wiltshire, music technology entrepreneur and CEO of Songtradr, Inc, founded the Santa Monica-based, global music licensing marketplace and distribution platform in 2014. Since the platform’s official global launch in 2016, the company has raised over $10 million in funding with the platform rapidly growing to more than 400,000 artists, producers and songwriters worldwide using the technology for content management, distribution and licensing. Songtradr is the only open and automated licensing marketplace of its kind with all types of music users from independent filmmakers, production houses and advertising agencies to major brands such as Google, Microsoft, Disney, Netflix and Amazon. Wiltshire’s career began as an award-winning producer/songwriter, having produced and/or composed music on more than 15,000,000 records, with 12 No.1 chart topping albums/singles and 28 No.20 albums/singles. He has worked with such artists as The Backstreet Boys, Vanessa Amorosi, Delta Goodrem, Human Nature and Australian Idol artists, including Guy Sebastian.